Turnouts are sections of track that allow trains to travel from one line of track to another. The points control which way the train will go. The switch rod is connected to the points and is pulled back and forth by the switch mechanism which can be either a ground throw (a lever operated manually) or by an electrical switch machine like a solenoid motor. Whichever switching mechanism is used the basic effect is that the points are changed from one side to the other which then changes the direction of the train. •	Insulated (also called “standard”) - These are easier to wire and install. They conduct power to both the main track and the diverging (branching) track at all times. If you want the branch track to be isolated, you will have to add a rail gap to the positive rail of the branch near the turnout, then add a feeder wire to that branch controlled by a switch on your control panel. The frog is insulated so that no power is supplied to the locomotive wheels at that point. There are small hidden wires in the track ties that supply power to the two track routes so that power gets to all the rails all the time and since the frog (where the tracks cross) is insulated, there are no short circuits as the train passes over. •	Power-routing (also called “selective”) – These require a little more thought in the wiring process, but have some advantages over the standard type. The main advantage is that the power to your branch is controlled by the direction of the points. Because of this, you only have to throw one electrical switch to change the direction and power the branch at the same time. You won’t need rail gaps for the branch in this case (unless the branch is receiving power from somewhere else); and you won’t need a separate electrical switch to turn the branch track on or off. However, you will need rail gaps on the frog end of the through track. These types of turnouts are a little harder to come by. Many hobby shops don’t carry them; you may have to order them through a catalog or online. They are produced by Walthers, Peco, Shinohara and Micro-Engineering only in HO and N scale. You can tell the difference between the 2 types by looking at the frog, which is plastic in the insulated type and metal in the power-routing type. Also the connector strip between the points is copper on the power-routing devices and plastic on the insulated ones. Why don’t the power-routing types cause short circuits? Because the power comes from the point end and travels through only one set of rails at a time. The points act as an electrical switch – When the points are directed to the through track, the power travels that way and the branch rails are dead. When the points are directed to the branch, then the through track beyond the frog is dead. The rails that cross at the frog are never live at the same time. The key with wiring the power-routing type is that the power must come from the point end of the turnout, and the through track must be gapped to prevent power from coming from that direction (assuming the through track is connected to the mainline). If the through track is just another branch with no other power source, then you won’t need the rail gaps there. These are turnouts (either insulated or power-routing) that have a switch machine or motor attached to the switch rod, which can be activated remotely to move the points back and forth, thereby changing the direction of the train travel. Most of these motors are solenoid and require a momentary type of electrical switch on the control panel and are powered by AC current from the AC terminals on your transformer. A momentary electrical switch is one that when you push it, it doesn’t stay in the position you push it to. It comes back to the neutral position automatically. This is necessary in this case because if the power to the solenoid is maintained for more than a second or two, the motor will burn out, heat up, melt the housing, etc. – none of which are good things. Each solenoid remote switch has 3 wires that come out of it that you need to hook up to the toggle or slide switch on your control panel. The wires are never long enough to go from where your turnout is to the control panel, unless you’re installing the switch on the fascia near where the turnout is located. To get the wires to your remote switch, you will have to splice extensions on the wires, or connect the wires to a terminal strip under your layout, then attach wires from there to your control panel. Follow the wiring directions that came with your remote switch, but usually, the middle wire from the solenoid goes to the center connector on the Atlas SPDT switch. The other 2 wires go to either of the side connectors; however, you should test which way the points go when the toggle is thrown one way versus the other. You may wish to wire the switch so that throwing the switch to the right will always line up your turnout for the through track and throwing it to the left will line it up for the branch. Whatever system you set up here, make it consistent so that you will remember which way the points will be thrown when you’re remotely making the switch from the control panel. When your remote switch is wired, if the points change to the wrong direction when the switch is thrown to the right, just reverse the 2 side-connecting wires to get it right. You can substitute a small momentary SPDT toggle switch for the Atlas SPDT if you wish. These often fit better on a small control panel. The wiring is a little different than with the Atlas switches as shown on the "Wiring a Solenoid" page. Sometimes, it’s useful to hook up 2 or more solenoid switch motors to one electrical control switch. 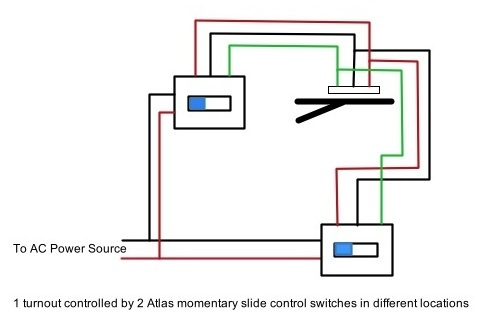 For example, if you have a passing siding connected to your mainline by a turnout on each end, you may wish to throw both devices at the same time. Similarly, if you have a crossover from one mainline to another, you will have 2 turnouts – one on each line – that will have to be thrown for the train to make the crossover without derailing. In this situation, you can connect the middle or common wires to each other and splice them together with a third wire that goes on to the middle of the switch on the control panel. 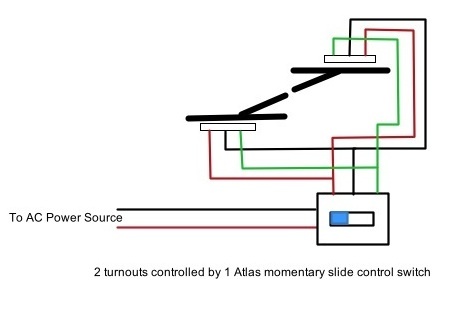 If both turnouts are required to be thrown to the diverging side at the same time, the one side wire from one solenoid can be connected to the same color wire from the other solenoid and spliced to a third wire to connect to the control switch. Likewise the other side wire should be connected to the same color wire from the second solenoid and spliced with a third wire to go on to the opposite side connector on the control switch. At the control panel, orient the side wires so that the points are thrown in the direction that you want when the control switch is pushed one way or the other. Test the connections by throwing the control switch. If it doesn’t work, you will have to troubleshoot and reconnect the wires differently. I wouldn’t solder these wire connections right away until you’re sure the connections are right and everything works as it should. There may be a situation in which you want to make 3, 4 or 5 turnouts all change with the control of one switch. If you want your train to travel 2 different routes at different times, you can wire all of these remote devices so that they line up correctly with the push of one momentary switch on the control panel. There is a limit to the number of these that will work at the same time depending on the amount of power your transformer will deliver. My standard MRC 12 volt AC transformer is adequate for 2, sometimes 3 solenoids. If you need more solenoids on one switch, you may need a higher output transformer. Some people like to have a separate AC transformer to control the remote switches and other accessories, so there is more power for both the trains and the accessories. The wiring is the same as described above, just more wires have to be connected together. In this case, using a terminal strip would be very helpful in making these connections. The main disadvantage with this setup is that it would be an "all-or-none" phenomenon. 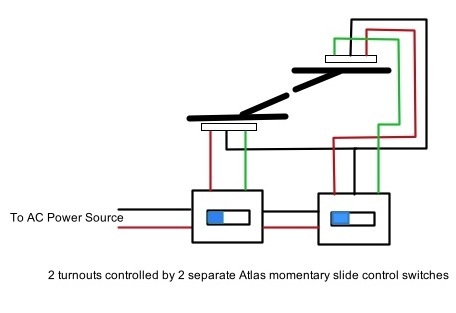 In other words, all of those connected switches would have to be lined up either one way or another. They couldn't operate independently unless you had additional electrical switches to isolate individual control switches. This gets a little complicated. 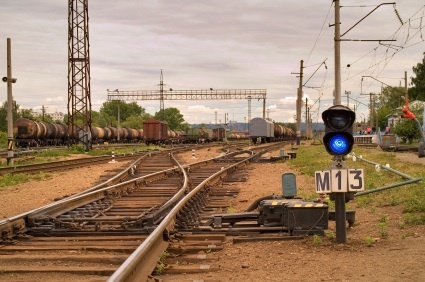 If you have a ladder of tracks in a freight yard, the "all-or-none" problem would be prohibitive for proper operation of the ladder with just one switch unless you set up a diode matrix. This is beyond the scope of this particular discussion, but there is an article about how to set this up in the July/August, 2008 issue of N-Scale Magazine, or check out the TracTronics website if you are interested in doing this. The above wiring for remotes can be used whether your track power is analog or digital-controlled, since power to the solenoid motors and control switches is coming from the AC terminals of your transformer and are not dependent on track power. However, if you have a DCC control unit, you can control remote devices with your walkaround digital control unit. You just have to have decoders installed and programmed for each switch machine. These are available by catalog and online if not in your local hobby store. Just follow the directions that come with the decoder with regard to the wiring and programming. The new “Flea” looks interesting though I haven’t tried it yet. It’s a very small decoder device that comes integrated with the turnout by the manufacturer and is currently only available in HO. You can read more about it at http://cypress-engineering.com. Tortoise switch machines are becoming popular these days. Again, follow the wiring directions that came with your model for proper installation. These are quieter and more prototypical than the solenoid switch machines. They are installed under the layout - a rod comes up from the machine to the switch rod to throw the points in one direction or the other. There are no distracting unrealistic solenoid machines next to the tracks when you use these devices, but they are more expensive than the solenoids. These are electrical switches (made by Atlas) that can be connected to your remote control switch on your control panel that will activate other additional accessories at the same time your remote turnout switch is thrown. For example, if you want to have station lights come on when a diverging switch is thrown, you can connect a relay switch between the station light and the remote control switch. Similarly, if you want a light on your control panel to come on when a turnout is thrown in one direction or another, connect a relay switch between the control switch and the light. When the relay switch is activated by the momentary turnout switch, the current to the light or other accessory stays live, while the current to the switch machine remains only momentary. You can automatically control turnouts, at least for the most part, by using magnetic Reed switches on both sides of the turnout in order to line up the points properly when a train approaches. Not only is this fun to set up, it can also help prevent derailments. For example, if the train is rolling down the mainline and the switch has been inadvertently set for the branchline, the Reed switch will automatically reset the switch for the mainline before the train gets there. There is another way to have automatic turnout control. Azatrax has a new 2-channel infrared train detector that has multiple operating modes. It can automatically set turnout points in response to an approaching train, for both twin-solenoid and slow-motion switch motors. The advantage over reed switch actuation is that no magnets need to be attached to rolling stock. There are lots of different electrical projects you can do on your layout. This page only touches the surface. As time goes on you may want to explore even more ways to make your layout come alive with sunset lighting, lighting for signs, billboards, streetlamps, etc. You can control your trains so they stop and go automatically when they come to a station for example. Or, with block detectors, when a train pulls into a certain block, other trains approaching that block will stop, or a crossing grade will be activated. The list goes on. See how exciting this is getting! From "Turnouts" to "Model Railroad Wiring"